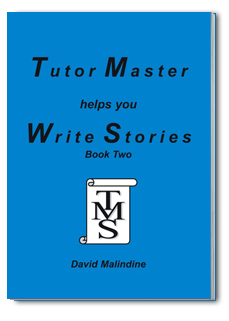 Working as a private tutor helping to prepare students for examinations has given David Malindine useful insights into areas of the curriculum where there is a deficit of educational materials to assist students with their preparation. A particular area of concern expressed by both parents and students was the fact that story writing was difficult, especially when the family background was one where English was not the first language. To help meet the need expressed, David wrote and self published the book Tutor Master helps you Write Stories Book One. This book aims to assist children of all ages and abilities by identifying the key 'Ingredients for a good story', some background on 'Parts of Speech - the jobs that words do in sentences' plus 20 story plans that provide a structure for students to use to develop their own ideas. You or your child is unsure what the important things are that a story should include. Your child will need to write a story for their examination and you need to know what the examiners are looking for. You need to know what the eleven important ingredients are for a good story. You need to know how Parts of Speech should be used (nouns, adjectives, verbs, adverbs, conjunctions, pronouns, prepositions, similes, metaphors) correctly in stories to impress examiners. You need to know how to include feelings in stories, both those of the writer and of the characters and where lists of feelings can be found that can be used in stories to make them more interesting. You know examiners are impressed if students can include speech conversation in their stories but you need to learn how to set it out clearly and with the correct punctuation. You are aware that examiners really like to see candidates using imaginative and descriptive writing in their stories but need advice and practical help to do this. You need to know what techniques can be used to make stories more interesting. Your child has been asked to write a book review and you need advice and help to know how to do this. You know that including speech, feelings and description in stories will impress examiners but you need help to know how this can be done. You know that using different and imaginative styles of writing can make stories more eye catching and readable, e.g. using different sentence starts, and would like to see some examples of what this means and how it is done.